Foo Fighters hit Vancouver on Saturday night (September 8), and they were joined by some unexpected guests onstage for a cover of "Under Pressure." During the set, the band picked out a girl wearing a Queen shirt to join them onstage for a rendition of the Queen and David Bowie classic. Introduced to the crowd as Madi Duncan, the young fan and another woman named Roxanne Engli joined Taylor Hawkins on lead vocals, while Dave Grohl took a spot behind the drumkit. The sound on the Duncan's mic is a little less than great, but she certainly seemed to be having the time of her life. 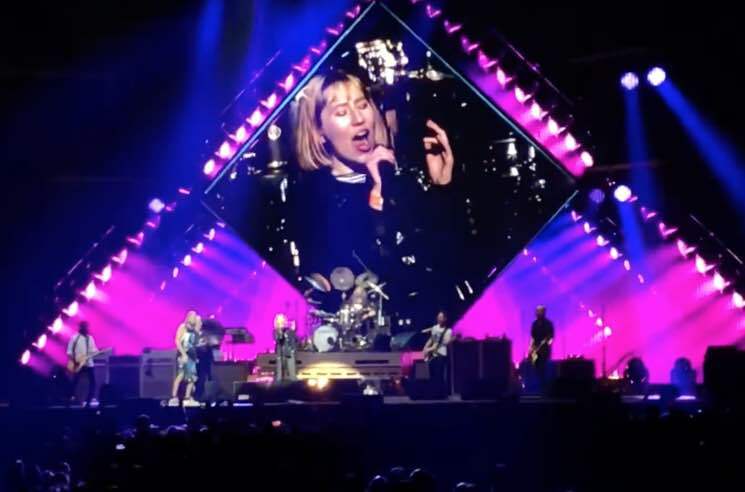 As previously reported, Foo Fighters recently covered "Under Pressure" onstage with Queen drummer Roger Taylor. You can revisit that performance here. An earlier version of this story misidentified Roxanne Engli as Madi Duncan's mother. She is not.